ThingTwo effectively had two birthday weekends. We visited my mum the weekend before her birthday, and she had a cake there, and gifts from my mum and sister. 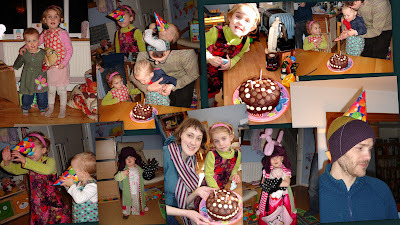 Then Anne's sister and her partner visited last weekend and we had more cake and more presents. These kids' birthdays are mainly for the benefit of the grown ups and their tummies. My GOd, I look exhausted! Are these on FB too? Don't fret - you can legitimately invoke the "I was woken at 6.45am by singing, shoulting kids" defence. I don't think the photos are on FB, but the post is in my profile as a "note". I can tag you in that if you like. Are you saying you do want it in FB or you don't? I do, Mark doesn't. Make of that what you will! I'll leave you to tag yourself if you want to then.